Learn why metal roofing has positive impacts on roofs in the Oswego area. You’ve likely heard an uptick in conversations being had around metal roofing systems namely because they are an excellent investment for homeowners in Oswego. Not only are metal roofs more energy efficient and highly durable, but they also provide longevity that is protective and beneficial to the homeowner. 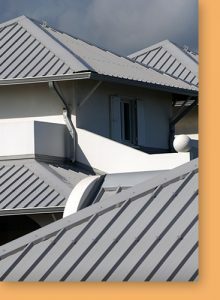 But, how much do we know about metal roofing? 31.6 percent of metal roofs are being installed in the midwest. At Advantex Restoration, we specialize in metal roofing systems and metal shingles that combat and withstand the weather that is thrown at Oswego. Let’s look more into detail at how metal roofs are paving the way as the leading roofing material. While there is no definitive age demographic of homeowners who are buying metal roofs, we know that they are growing at a faster rate than any other roofing material and the Chicago Tribune even gives them a nod! New homeowners in their 20s in addition to the Baby Boomer generation are all climbing aboard and investing in metal roofs. The average metal roofing project in the midwest is about 2,730 square feet which is the second highest only second to the south. Part of the reason metal roofs are becoming the preferred roofing material is that of its lifespan. traditional asphalt roofs have a life cycle of 20 years, while metal roofs can last up to 60 years. They have the leading durability and longevity, and yes they are twice as expensive, but you get three times the longevity which gives it an inherent value over other roofing materials. Choosing a metal roof in Oswego makes a lot of sense because of the extreme weather patterns we see — from strong winds and hail to winter blizzards and ice storms — the weather can quickly turn destructive in the midwest. The cost per metal shingle or metal roofing system will vary from region-to-region, but the prices in the midwest stay constant and prove to be worth the investment for homeowners. Why Are Midwesterners Choosing Metal Roofs? People of Oswego are choosing metal roofs because protection and strength to withstand the elements ( 17 percent), for its lifespan (18 percent), and because it added value to their homes (20 percent). The most surprising (but really not so surprising) reason homeowners are choosing metal is for aesthetics — they look so great! So, even if you have all the protection from mother nature, it’s all just a benefit to the way the roof looks! Take a look at the roofing projects that we’ve completed in your area here! If you live in the Oswego area, you are going to need a roof that has the longevity and the durability to endure everything that the elements conjure — heavy sun exposure, rain, wind, snow, ice, and the occasional tornado, in addition to the home depreciation it brings if it has been battered and bruised. A metal roof will not only add a classic style to your home’s architectural features, but it’s tough and adds value. 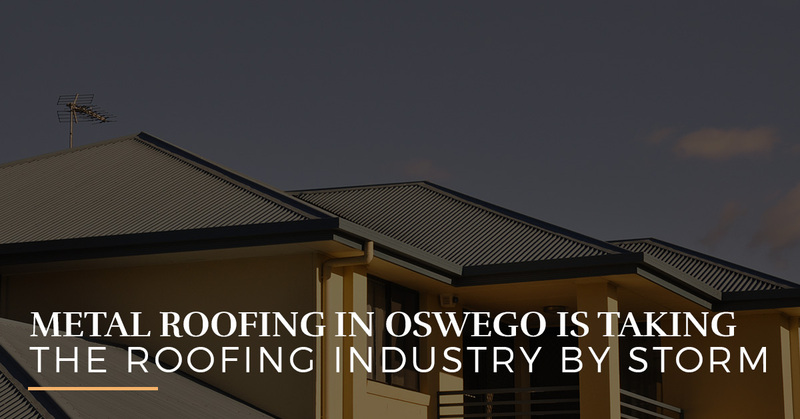 A roof is a vital part of your Oswego home, after all, you want something that will protect you from the elements, last throughout many decades, and add value. This is why a metal roof is for you! Invest in a metal roof and schedule a consultation with us today!